A view of downtown Oakland from the Lake Merritt trail. The Alameda Courthouse and the Tribune Building are two of the more recognizable buildings seen here. A prominent water feature in the middle of a large city with ample miles of walking paths around it is a city planner's dream. 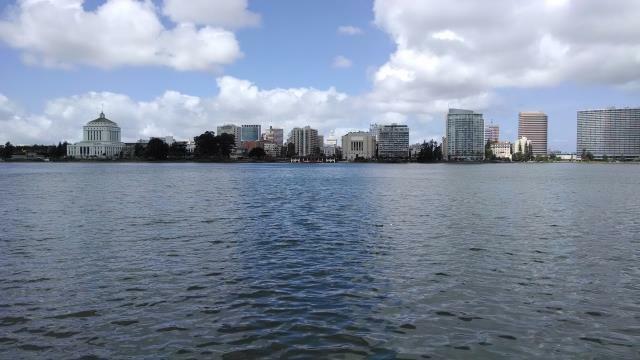 Oakland has just such a jewel in its crown in the form of Lake Merritt. Surprising to many, Lake Merritt is the first official wildlife refuge designated in the United States, a distinction it earned in 1870. The tidal lagoon served as an important stopping off point for birds migrating north or south along the California coast. Though a lake proper now and not a lagoon due to controlled water flow, it nevertheless continues to be a draw for humans and birds alike. The trail near the northeast arm of the lake. A pergola built along the shore provides views towards downtown to the southwest. The path around the lake is mostly paved and typically flat. Walkers and hikers of all abilities should be able to enjoy the lake to the fullest extent possible. Rather than a single trail around the lake, there are several paths that interconnect and braid themselves around the lake's edge. One is more uniform and follows the surrounding roads, little more than a sidewalk. The other hugs the lake more closely. In many segments the walkway edge falls directly into the water. There are a number of things to do and see around the lake besides walking. Oakland's Fairyland sits in the peninsula on the north shore of the lake. This precursor to Disneyland actually provided Walt Disney with some ideas and inspiration for his signature theme park. The Lake Merritt Boating Center rents paddle boats, sailboats, canoes and kayaks. The calm waters of the lake make for an ideal place for a leisurely outing on the water. You can't help but notice the wild array of birds along the shore or on the water. If you want to find out a bit more about them, pause from you hike a bit and stop by the Rotary Nature Center. Coppertone and I circled the lake, typically taking the paths closest to the lake itself when options presented themselves. It was borderline warm or cold depending on how much Sun or shade we happened to be under at the moment. We stopped in a few places to take a closer look at the many birds that inhabit the lake, or use it as a stopping point on their migrations. The seven Canada Geese goslings were a big draw by folks near the nature center. The only guide dedicated entirely to hiking San Francisco’s East Bay has been revised and updated, and features 3 new trips in Contra Costa County. Includes 56 trips for hiking, bicycling, and horseback riding on oak-studded hills, grassy ridges, rocky peaks, forested valleys, and salt-marsh shoreline. East Bay Trails is the most complete and up-to-date trail guide for Alameda and Contra Costa Counties. While the route descriptions pertain to hiking most of all, other outdoor enthusiasts-fitness walkers, joggers, equestrians, and bicyclists-will also find them useful.